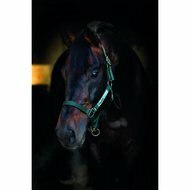 It is a beautiful and strong halter that opens in emergency situations. Super for safe grazing. The idea behind this halter is very appealing, but unfortunately the buckles are just of moderate quality. 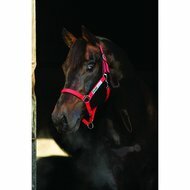 Halters of the brand Anky or Shires are simply better quality. Nice halter. Sizing is normal. We use this safety window on the meadow and in the paddock with a fly net. 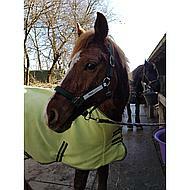 This halter bought, because he now keeps the halter in the meadow with his new barn. Because I do not want him to catch on something, I bought it for safety. Has not been necessary yet. Halter looks sturdy and has a nice fresh blue color. Easy to adjust. On the inside the halter with soft fabric is deposited. Reflective pieces on the side. 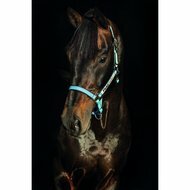 So that the horse can also be found in the dark. ;-) Excellent quality.